Black Seed & Honey (Original) 16 oz. In this unique vitalizing herbal tonic we have synergistically infused with some of the best natural blend of honey and herbs.THE BLACK SEED HONEY is a deliciously creamy healthy tonic.Can be mixed in any hot or cold beverage*. Take one tablespoon daily or as directed by your holistic physician. Can be mixed with hot or cold beverages. Not to be taken by pregnant women or children under 1 years of age. Raw Wild Flower Honey 16 oz. 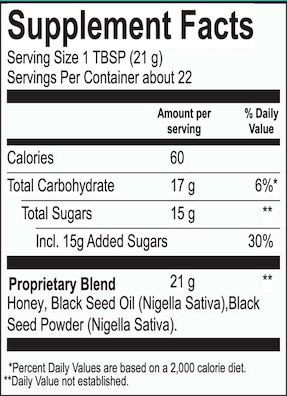 Power QS Nutritional Honey Blend 16 oz. Black Seed Honey Nutritional Booster 16 oz. His Honey Natural Herbal Enhancement For Men 16 oz. I wanted to let you know that I am usually ill at this time of year because of the flucutations of weather and everyone around me bieng sick. I am pleased to tell you that I have been using this product for about two or three months and I am without illness. I dont think it is a coincidence. I used this blackseed and honey after my hysterectomy surgery. While I was on pain medication, which normally causes me severe constipation, I had NO problems. My bowels worked fine and I was able to go with no pain. It also helped speed up the healing process to where I was back to normal activities 2.5 weeks after where it usually takes 4 - 6 weeks to return to normal levels of activities.